Back from Houston and even though I was gone for just a few days, it feels like a week! I'm spreading my Quilt Market experience into a few posts, so not to overwhelm in one lengthy post. Andie @ Andie Johnson Sews gave me a quilt quite some time ago to quilt for hers and Kelly's new book "Modern Designs for Classic Quilts". I was completely tickled when I got TWO in the mail just before I headed to Market. Complete surprise! It's a fantastic book filled with some fantastic quilts! Here are a couple of Andie's quilts I quilted up for her. Ever since I quilted up her black and white "Midtown Girl" quilt, I've been impatiently waiting to show pictures of it, but now finally get to do that! It's such a beautiful quilt and I had a blast quilting it up! Helen and I got to meet Andie and Kelly! Here they are at their book signing. Here's Andie and I. We hit it off right away, no surprise there! We enjoyed dinner with them and loved chatting about many different things! Thanks for the good time Andie and Kelly! These are just a few of the QCR Churn Dash's! 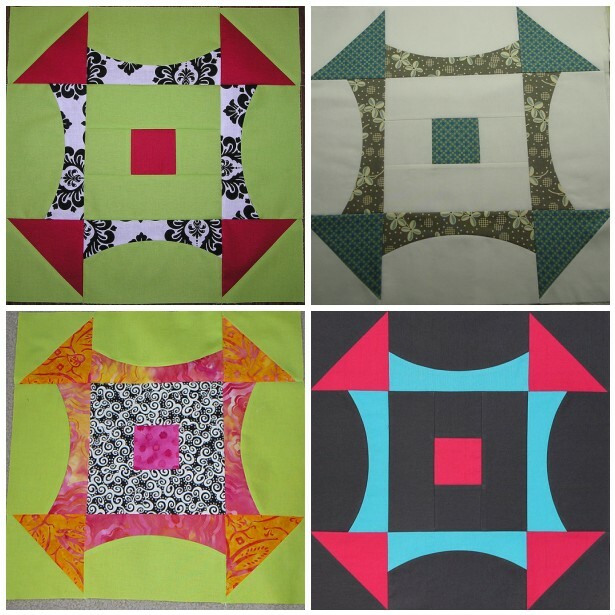 You can see more on the Flickr Group and it's not to late to get a Quick Curve Ruler to join in on the fun! The 2nd block will be the Saw Tooth Star posted over on Helen's blog, November 8th.